It’s a funny thing about seeds: First you worry that they’re not going to sprout; then you worry how you’re going to deal with all of the seedlings. It’s so easy to sow a dozen pots, plunk them onto a heating mat, and fit them neatly onto a shelf under a single fluorescent light fixture. It may take a few days for the first leaflets to appear, but before you know it, the pots are filled with forests of study little seedlings. The next step is to transplant those seedlings into individual pots. And then, my friends, is when reality sets in. Why does this reality take me by surprise every year? On one hand, it’s an absolutely thrilling thing: A single packet of seed becomes a full pot of seedlings, which results in dozens of wonderful new plants. But that same reality is shock from a physical-space standpoint: A single packet of seed turns into one 3.5-inch pot, which turns into dozens of 3.5-inch pots. Multiply that by over 100 kinds of seeds, and the problem is obvious. Today was my first transplanting session of the spring. (Later on, I’ll start being more realistic about what I really need, and I can make myself toss excess seedlings into the compost pile. But right now, every seedling seems precious, so I can’t bear discarding any of them, even if I really should. Why do I need 17 plants of ‘Violetta’ artichoke, or 14 pots of ‘DiCicco’ broccoli? (And why did I just sow another pot full of mixed broccoli seeds?) Do I really need 50 plants of ‘Greek Salad’ onions (well, maybe I do; they’re the best red onions I’ve ever had) or 50 plants of ‘Blue Solaize’ leeks? I’ll tell you, potting up 100 onion and leek seedlings is exactly as exciting as potting up 100 blades of grass. 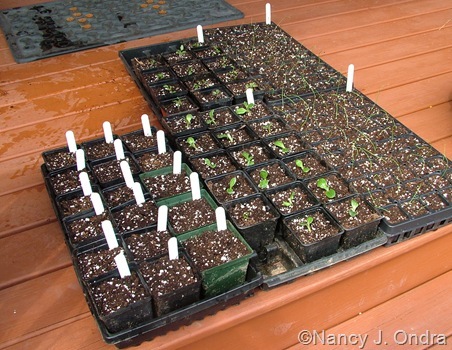 At least I could cram them into trays with 2-inch cells, instead of individual 3.5-inch pots. Even so, those four pots of seedlings, which took up less than 1 square foot, now fill 8 square feet: one entire shelf of my three-shelf light stand. I still have 10 other pots of seedlings to pot up, and I sowed 18 more pots of seed today. You can see where this is going, can’t you? Well, I’m not prepared to worry about that quite yet. 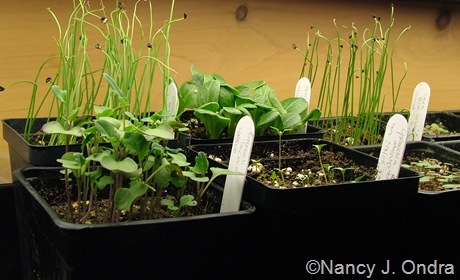 I’ve decided that the broccoli, onion, and leek seedlings are tough enough to live in the cold frame during the day and the kitchen at night, so I’ll keep the space under the lights for the agastaches and other more cold-sensitive seedlings. That means I should be ok for another week or so. Whew. Right now, I’m still inclined to find this all terribly exciting. 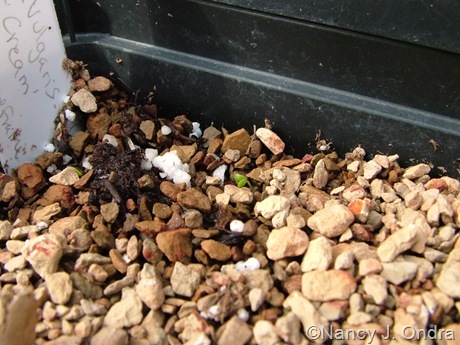 When I was moving the winter-chilled seed pots out of the cold frame to make room for the broccoli, onions, and leeks, I found a sure sign of spring: the very first outdoor seedling! Yes, well, what can one do? I really ought to tidy up before serious transplanting begins, but I think I’ve left it too late; there are many more interesting things to get into now! I hope your own seedlings are thriving, Melanie. You got it, Elly. I’ve read that the trick to getting them to bloom the first year is to move the seedlings outdoors for a few weeks around now so they get a bit of chilling, then bring them back into the warmth to get them growing again. I’m trying that, so we’ll see if it works! And hey, I’m open to vermicompost, sans verms. So true! Living down south, I plant all my seeds outside. I never had much success with direct sowing, so I have a special starting bed. But this means I have to thin and transplant them. I always end up with far more seedlings than I have room for or can give away. And it hurts so to have to put them on the compost when they get too big and leggy to transplant. That’s a good idea, mss! I too don’t have great luck with direct sowing, but it also seems wasteful to use so much potting mix with indoor-started seeds. I think I’ll try setting aside an outdoor seed-starting bed for the easy stuff that doesn’t mind transplanting. Thanks for the tip! Yea for you! It doesn’t matter if you have more seedlings than you need… do you know anyone nearby that could use some? Otherwise, will they all grow once they’re planted? I’m still very impressed! :-) P.S. And they all look so Healthy! I’m thinking that anyone within walking distance who leaves their vegetable garden gate unlocked is going to find some unexpected edibles growing this year. I predict a good harvest of onions and broccoli in our area! Your seedlings look so healthy. I hate to thin and transplant seedlings, I don’t like to discriminate against any seedling, I want them all. I’m quickly running out of space and just purchased more seeds. What was I thinking? Can one ever have too many seeds, Robin? I think not. 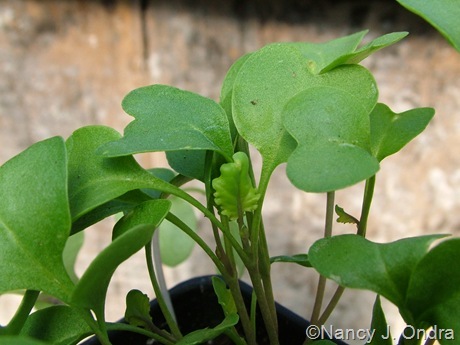 And you know, having extra seedlings makes one very popular at plant swaps! Makes me jealous!! I don’t do vegetables but love seeing some of yours. Looks like you got a good crop going there!!! You don’t do veggies *yet*, Anna, but I bet you might once you get your ornamental plantings in order! Nan, that is too funny. Why do we plant so many seeds when we know there isn’t enough room? This is the stage when I am tempted to put them outside too early because there is no room in the inn. I have grown leeks for the first time for some unknown reason, reading about them on a blog probably! How do you grow them? Just like an onion? Thanks for letting us know you can be messy too! I’ve learned to sow just a few seeds so I get a manageable number of plants. The problem, then, with purchased seed is what do you do with all the left over seed? Most of the time I forget to try to give it away & I end up with ancient half-empty seed packets at the back of a shelf in the garage. Quite right, MMD. So often (for me, anyway), it seems much easier to sow the whole packet, with the hope of finding a use or another home for the extras. I sometimes save partial packets (they make up a good part of the “junk” on my potting bench), but then I end up ordering new packets the following year anyway. Every few years, I mix all of the remnants together and toss them into the meadow. Nan, thanks for the site about leeks. But it was very confusing! Did you read it? My leeks are American Flag, could be summer harvest or could be winter harvest, they were showing how references will say different things about the same cultivars. Maybe I will just let them flower and call them ornamentals! You’re right: the intro part was a little confusing, but I thought the sections on sowing and growing were pretty interesting – especially the tip on orienting the leaves all the same way so you can set the plants just a few inches apart. I don’t think I’m going to try the deep trenching this year, though! Wow Nancy! You’re doing great. I’ll just be starting this weekend. I’m growing lots of natives this year. I purchased seed from the Hardy Plant Society seed exchange, and from Prairie Nurseries. This year I’ll be planting some at Hansel Park in Buckingham. They do a nice job of maintaining their meadows. They mostly have meadow grasses, so I think some wildflowers will be a nice addition. Your plans sound great as well, Cathy. I too have lots of seeds from HPS; I didn’t realize you were a member! I’m not familiar with Hansel Park; I’ll have to check out their meadows some time. It’s comforting to know I share my addiction with well-respected blogging friends :) Just today I’ve been trying to figure out where I can put these tiny seedlings straining toward the light. I want to put them on the covered side porch but it’s still too soon. I need a shelf with a grow light! Used to have one. I’ll have to hunt it down. I loved seeing your potting space Nan, and have great admiration for your honesty…it makes me feel so much better :) Thanks for this uplifting post. I loved it! I hope you do try the calibrachoas this summer. They do well in window boxes for me too. I use just one per WB with ivy geraniums, petunias and Alyssum. They trail over the side and look great. We may be obsessed with seeds, but it’s a pretty harmless obsession, I think! I definitely will try the new calibrachoas; thanks for the inspiration. I tried them when they first came out and was diasppointed by them, because they seemed so frail. But I’ve been drooling over the rich new colors, and the plants look much more vigorous now. I can’t wait to go shopping!